Are you wondering where our local Federal election candidates stand on environment issues? 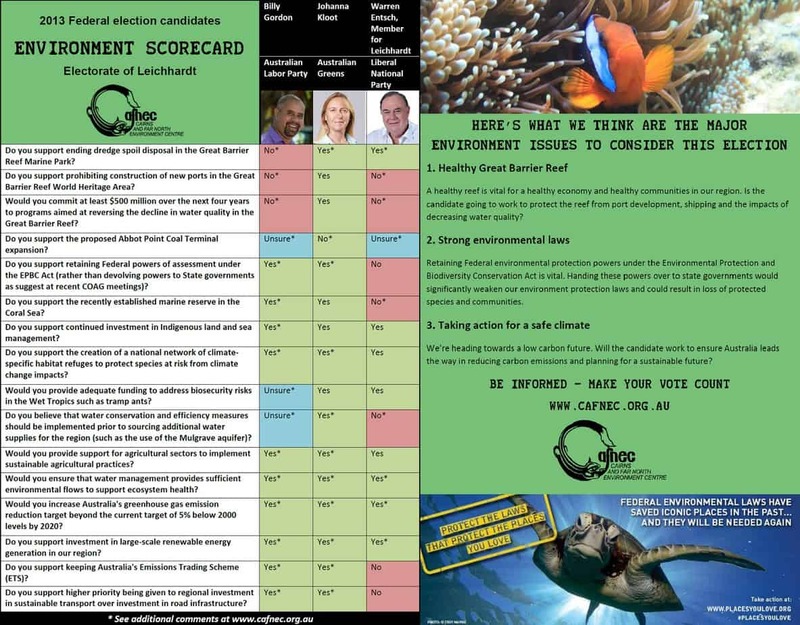 We asked the candidates in Leichhardt a few questions to find out, and have created a scorecard to compare them. A healthy reef is vital for a healthy economy and healthy communities in our region. Is the candidate going to work to protect the reef from port development, shipping and the impacts of decreasing water quality? For more information check out the Australian Marine Conservation Society’s Oceans policy comparison. Retaining Federal environmental protection powers under the Environmental Protection and Biodiversity Conservation Act is vital. Handing these powers over to state governments would significantly weaken our environment protection laws and could result in loss of protected species and communities. We’re heading towards a low carbon future. Will the candidate work to ensure Australia leads the way in reducing carbon emissions and planning for a sustainable future? For more information check out Vote Climate’s election scorecard for a comparison of major parties’ climate and energy policies. For general election scorecards check out the Get Up! election scorecard or the Australian Conservation Foundation’s comparison of major parties’ environment policies.